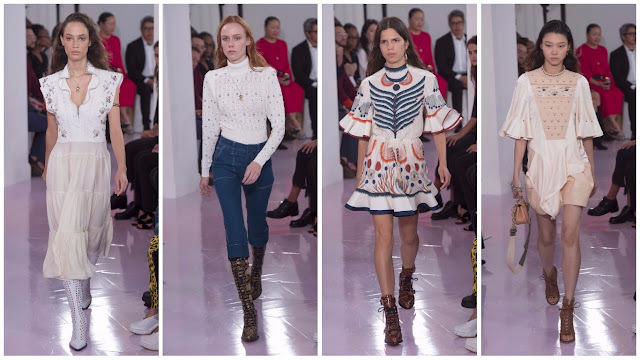 Chloé’s new creative director Natacha Ramsay-Levi presented her debut collection for the house on Thursday morning to an eager fanbase including her former employer, Nicolas Ghesquière. (Ramsay-Levi was one of three of Ghesquière’s disciples to present at Paris Fashion Week yesterday—the others were Julien Dossena at Paco Rabanne, Antonin Tron at Atlein.) Chloé, founded in 1952, has long been characterised by an ‘attitude’—it being feminine, sophisticated, joyful. There are instantly recognisable staples but one observes Chloé as much more than just the clothing rolled out in stores globally. Over the years designers of distinguished pedigree have passed through the doors: Karl Lagerfeld, Martine Sitbon, Stella McCartney, Phoebe Philo, Hannah MacGibbon, Clare Waight Keller. Joining the ranks in the quest to reestablish the Chloé ‘attitude’ is Ramsay-Levi. (She is the first Frenchwoman at the house since Martine Sitbon in 1992.) For Spring 2018, one caught whiffs of Philo’s iteration—in those sumptuous velvet pieces and MacGibbon’s penchant for rich colouration and snakeskin. 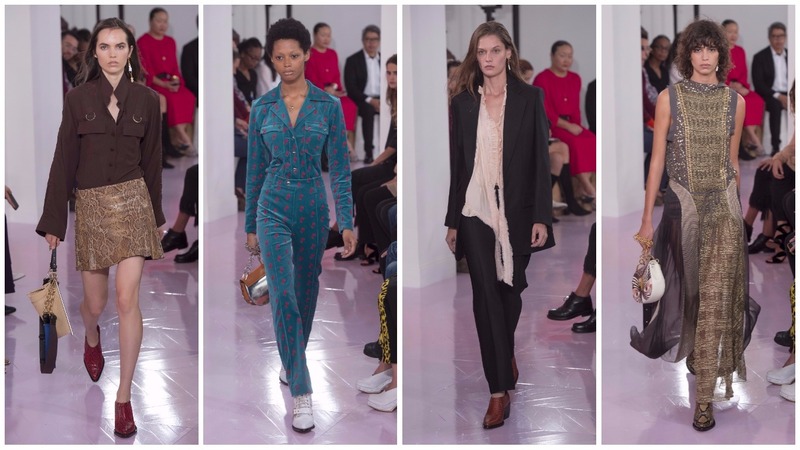 Towards the end of her reign, Waight Keller’s Chloé woman was too whimsical—it lacked depth and attitude. In an effort to restore that, Ramsay-Levi infused the collection with Ghesquièrian principles—the past, the present, the future collided in brilliant fashion; there was the futurist Western-inspired look; the cascading ruffle supported by a powerful shoulder; the way her silhouettes refer to both symmetrical and asymmetrical modes. Many will have qualms with the thematic crossover but one must remember Ramsay-Levi’s signatures will be similar to Ghesquière’s, the designer she worked with for fourteen years. Although there was evidence of her previous employer, one considered this to be a fine opening chapter with recognisable Chloé motifs. The 70s, specifically, were referenced. The brand was represented beautifully by photographer Guy Bourdin in the 1970s. Bourdin’s photography, according to Christian Caujolle, the author of the ‘Femininities - Guy Bourdin’ book to accompany this summer’s exhibition at Maison Chloé in Paris, creates a universe. “A universe in which the clothes are no longer the subject of a proposition but instead just one ingredient in a complex world, freed of the practicalities of day-to-day life but still suggesting something tangible and real. A world in which liberated, nimble and elegant actresses mischievously play at reinventing a world in which women are the fulcrum.” The eventual wearers of these garments were on Ramsay-Levi’s mind. She wants to fashion clothes allowing them to channel their inner strength, rather than power. One got the impression she was exploring the terrain of playful mischief, but was caught up in the rigour of modern day fashion presentation. Perhaps rectifiable in future advertising campaigns? This was an exercise on how to debut at a fashion house as storied as Chloé. From the outset, Ramsay-Levi declared she would be reinvigorating the house codes, adapting her style around them and creating something that makes sense for women now. Her intention was never to create “Natacha’s brand”. Her brief has always been to interpret house codes, at both Balenciaga and Vuitton. Here, her knowledge was hybridised with that of Chloé’s and the results were remarkable. A rare statement to utter when a house is in the hands of someone new is: the future is bright. 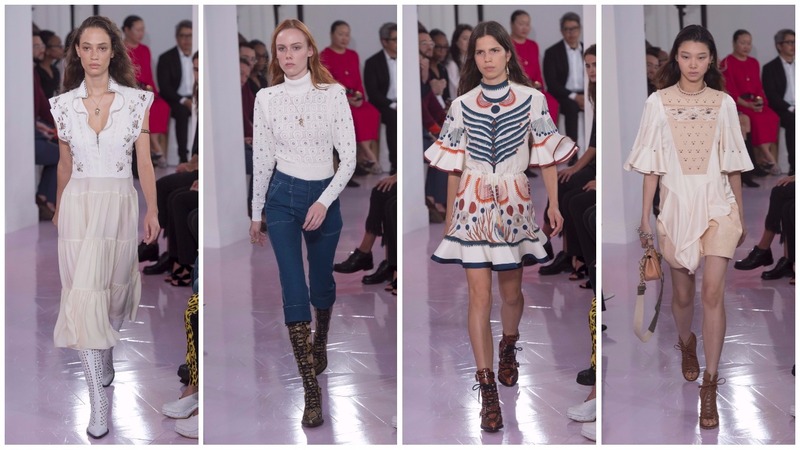 Assertively, one could say, the future is bright for Chloé.